This is Buffy from the 1960s television show, Family Affair. Isn’t she cute? 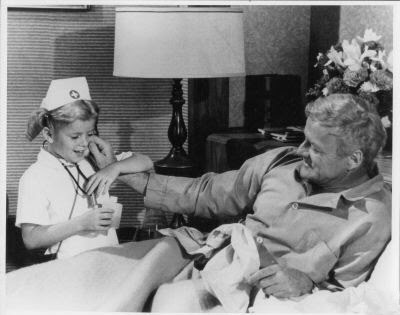 Uncle Bill is sick, and she’s stepping up to the plate as the family caregiver. I bet she gives really good injections to her dolls, too. 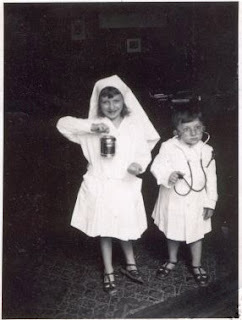 Do you remember playing nurse when you were growing up? I played with some really cool nursing kits, but I never had a cap. I wonder if Buffy’s kit is an exclusive from FAO Schwarz. This week I’m saluting the children who always said, “When I grow up, I'm going to be a nurse.” Where would we be without these kids? 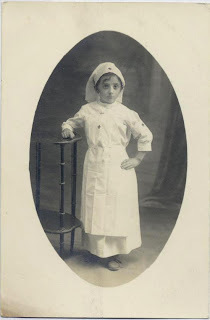 So sit back and relax while you enjoy some of the best posts from the nursing blogosphere at this week’s edition of CoS.
Now this little lady looks like she means business. She has her hand on her hip, so everyone better watch out. I can only imagine what she would have said about stupid hospital policies regarding medication reconciliation sheets. ERnursey from ERnursey - An Emergency Room Nurse Blog has plenty to say about the subject. Needless to say, she isn't happy. Read her rant. Nurses are sick and tired of a lot of other things, too. Smalltown RN from A Place I Call Home writes about working another very LONG shift. Her post answers the question, "Why are nurses leaving the profession?" FetchingGal from Lemon Tree Forest hates her working conditions at work. Read her post to find out why she can't take it anymore. 5 Wester from 5 West Nursing loves a bargain, but not at the cost of safety. Read how cutting corners puts nurses at risk. Look at the smile on that little girl's face. I wonder how she talked her younger brother into wearing a dress. Or maybe he’s wearing shorts and a white lab coat. Give the lad credit for playing nurse with his big sister. He's one cool little dude. Max E Nurse grew up to be a nurse, and he writes about staying cool and calm during an emergency. Read his post about keeping cool when all you really want to do is freakout. 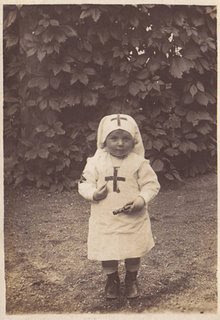 DisappearingJohn RN is another little boy who grew up to become a nurse. He's feeling a little guilty right now. Read his post and learn about the downside of receiving a pay raise at work. This little girl’s body language is saying, “I really love wearing my nursing uniform. I think I look cute in my cap.” An individual’s body language can speak volumes, and Terry from Counting Sheep describes the subtle messages that are communicated in the Operating Room. This little girl looks so sweet and kind. I hope she was able to handle the stress of being a caregiver. Nocturnal RN from A Float RN writes an emotional story about a very bad code, and it's aftermath. This type of experience can cause burnout. Hueina Su from Intensive Care for the Nurturer's Soul writes about the stress of being a caregiver, and how to avoid Nurturing Burnout. This future ER nurse is caring for a patient that has a leg injury. She is delivering impeccable nursing care. ER nurses deliver care to patients with every illness and injury known to mankind, and they frequently deliver that care under combat conditions. Erica from Blissful Entropy writes about what it's like to take care of someone that you love while you are working in the emergency room. ER nurses wish that their patients would take better care of themselves so that they wouldn't have to come to the ER in the first place. GuitarGirlRN from Adventures of GuitarGirl RN believes in the power of patient education and preventative care, and she tells patients what to do, and what not to do, when they come to the big city. Kim from Emergiblog gives readers an insider's look at what it is like to work in an emergency room. Her pictorial essay is very entertaining, and complies with all HIPAA regulations. You’ll see what I mean when you check out her post. This is a group of future pediatric nurses taking care of their patients. 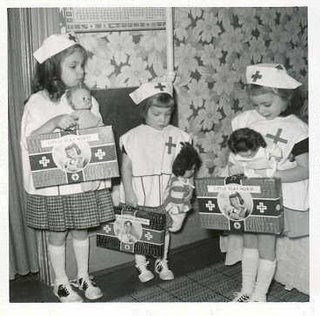 Their nursing kits are full of the latest equipment, and they look very professional as they wear their nursing caps and their saddle shoes. These nurses conduct themselves appropriately because their parents will not tolerate unacceptable behavior. They say please and thank you, and they don’t act like brats when their parents take them to the hospital for medical care. Miss-elaine-ious from The Life and Times of a Longterm Student writes about whimpy parents who let their kids get away with bad behavior. She says that lack of parenting is effecting the treatment children receive when they come to the hospital for care. And speaking of pediatric patients, FitBuff sends in this post about lead poisoning. We're hearing stories of excessive lead in everything from toys to lipstick these days, but very few people understand the risks and symptoms associated with overexposure. There has never been a better time to be able to recognize lead poisoning symptoms. 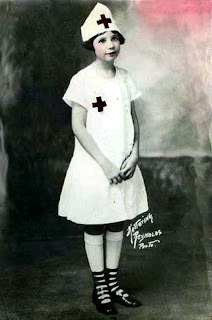 This Florence Nightingale in training looks like she is only two or three years old. I bet there were nurses in her family, and that they were hoping that she would follow in their footsteps. Why else would you dress up a toddler as a nurse? Entering the the nursing profession is a tradition in many families, and people who come from that tradition understand the sacrifices that they must make in order to get one of their own through nursing school. It can be a stressful time for everyone, including the family pets. Caroline from Brain Scramble talks about how her time in nursing school is affecting a four legged member of her family. There is a website that will help ease the stress of nursing school. Jimmy Atkinson presents The Ultimate Guide to the NCLEX Exam posted at Nursing Online Education Database. According to the information provided on the back of this picture, this photograph was taken around 1918, during the time of the Spanish flu outbreak. Pandemics are very scary. Beth from PixelRN is rolling up her sleeves and is giving flu shots to her coworkers. She’s asking that we roll up our sleeves, too. I wonder how many of these kids actually became nurses. 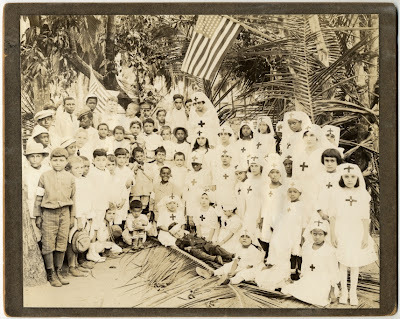 This picture is from 1918, and these kids are all junior members of the International Red Cross. I bet a lot of them went into nursing. They look very serious about what they are doing. The gang and I want to thank you for stopping by CoS. Kim from Emergiblog is serving as the host of the next Change of Shift on November 15th. Don't be shy. Start working on your submission, and I'll see you at the next Change of Shift. 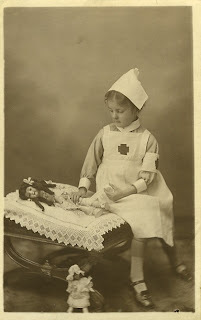 I love all the pics of baby nurses. Great job, as usual! Many new nurse bloggers this week!! Gotta get my links up! Great theme, lots of new blogs I haven't read before--thanks! Thanks for my inclusion with some really great reading and photos. This post is a freaking piece of art. Aside from that, all I remember from 50's -60s teev and medical shows is that Ben Casey was hot, and Dr. Kildare was, too. Thank you so much for including my post! I love the theme and great baby nurse pictures. Can't wait to read the posts. Thank you for such an entertaining theme. I would like to submit a story. What are the guidelines? Who do I submit to? Thanks for stopping by and leaving me the information. I hope I can come up with something good enough to submit. Buffy? You don't mean the Vampire Slayer, do you? That was amazing....how you linked it all together..and the stories...truly inspirational and insightful...thank you for a job well done! I am frantically trying to buy a "nurse's kit" for my granddaughter. All I can find is Doctor's kits. There is a nursing shortage people, you would think the ANA would jump on the wagon and ask Fisher-price to promote nursing. I may well buy her a real stethoscope and BP cuff, she already uses mine anyway!